There is an increased risk terrorists could get hold of chemical, biological and nuclear weapons to attack the UK, the Home Office has said. The assessment comes as Home Secretary Jacqui Smith unveiled a new UK strategy to tackle an evolved terrorist threat. It warns failed states such as Iraq have made it easier to obtain materials for weapons such as dirty bombs. Ms Smith said the threat is "severe" - meaning an attack is "highly likely" and "could happen without warning". The BBC's home affairs correspondent, Daniel Sandford, said chemical, biological, radiological and nuclear weapons "have always been something al-Qaeda have aspired to" but the report warns they are now within terrorists' grasp. "There is a concern now among officials in the Home Office that the chances of them getting hold of this material have increased in a world of failed states, in a world of easy availability of radiological material in hospitals and in a world of greatly increased smuggling of these kinds of materials." He added that the greatest concern was not over an attack by a nuclear warhead, but with a so-called dirty bomb which could contaminate a wide area and trigger panic. Mr Sandford also said the report warned the al-Qaeda leadership "could well be killed or captured, but that doesn't mean the threat would go away" because new groups and affiliates had sprung up that adhered to their ideology. However, in one ray of optimism in the report, he said there was a suggestion the threat level could be down-graded over the coming year. Ms Smith said to fight this evolved threat, the UK could not just rely on police and intelligence agencies. She said "terrorists will try to stay one step ahead of us" and that counter-terrorism was "no longer something you can do behind closed doors and in secret". 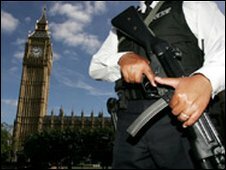 The home secretary said Whitehall needed "to enlist the widest possible range of support", and the new UK terror strategy includes training 60,000 workers in vigilance for terrorist activity and what to do in an attack, among them shop and hotel workers. She added: "We've made sure that we've invested the resources, built the people - both in the police and in the agencies - and built the widest partnership necessary to give us the best chance of being able to deal with that threat." She told the BBC: "We can't tackle terrorism simply from Whitehall. I don't think tackling terrorism is simply something we can rely on our police and intelligence agencies to do, brilliant though they are - we need to enlist the widest possible range of support." The new counter-terrorism document also talks about the need to "challenge those who reject the rights to which we are committed, scorn the institutions and values of our parliamentary democracy, dismiss the rule of law and promote intolerance". A senior Whitehall source said Muslim leaders who urged separation would be isolated and publicly rejected, even if their comments fell within the law. That idea was backed by Maajid Nawaz - a former member of the Islamist group, Hizb ut-Tahrir - who now heads the counter-terrorism think-tank, the Quilliam Foundation. Mr Nawaz told the BBC: "We as a government and a society have tolerated for too long people that have advocated a violent philosophy. "Though they haven't lifted a finger themselves, that violent philosophy has then been adopted by others who have lifted a finger. "The point I'm making is that we need to not just use all the powers of law enforcement to stop those who are actively trying to harm civilians, but also we need to use all the powers of the mind and the tongue to challenge those who propagate a violent philosophy." But the Tories have said not enough action is being taken against extremists. Shadow home secretary Chris Grayling said: "The horrific recent events in Mumbai have highlighted the need for fresh thinking in counter-terrorism - and the whole community needs to be involved in tackling the danger. "No part of the UK is free from threat - and we know that terrorists want soft targets. But we have argued strongly that the government is not doing enough to tackle the problem of individuals and groups in the UK who are fostering the hatred and extremism that lies behind the terrorist threat. That really does have to change".